Do you ever lie awake at night wondering what the world will look like in two or three hundred years? Ben Franklin did. And he thought that by the 21st century not only would humanity have some absurdly cool gadgets, men might live to be over 900 years old. I have sometimes wished it had been my destiny to be born two or three centuries hence. For invention and improvement are prolific, and beget more of their kind. The present progress is rapid. Many of great importance, now unthought of, will before that period be procur’d; and then I might not only enjoy their advantages, but have my curiosity satisfy’d in knowing what they are to be. Franklin acknowledged that he might sound foolish, wishing that he'd get to see 300 years into the future. But he saw great hope for the people of tomorrow in being able to ward off disease. By avoiding sickness, Franklin explains, humans might be able to live as long as biblical figures. Men like Adam (the original dude), Noah (the big flood dude), and Methuselah (the oldest dude) were said to have reached over 900 years of age. I see a little absurdity in what I have just written, but it is to a friend who will wink and let it pass, while I mention one reason more for such a wish, which is that if the art of physic shall be improv’d in proportion with other arts, we may then be able to avoid diseases, and live as long as the patriarchs in Genesis, to which I suppose we should make little objection. While medical advances have certainly extended lifespans beyond those in Franklin's time, one wonders if he'd be thrilled or disappointed with our technological advancements. Sure, we have amazing technologies like the internet. But when we're using it for things like Outbox (literally the dumbest thing ever invented) he may think we've got a collective screw loose. 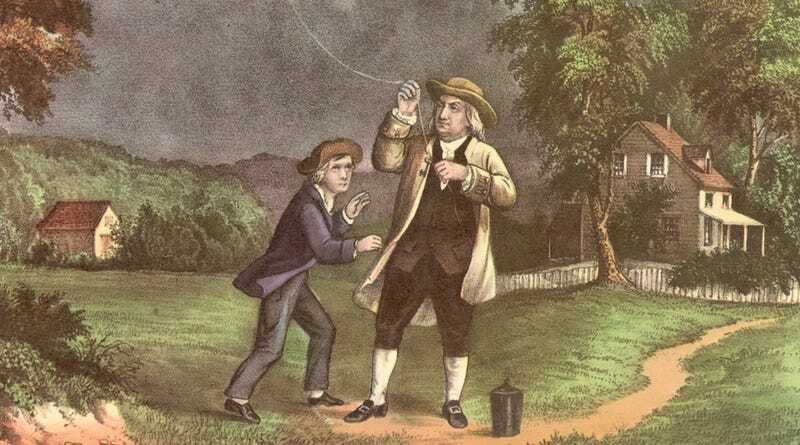 Image Source: Getty Images "A Currier & Ives lithograph of Benjamin Franklin and his son William using a kite and key during a storm to prove that lightning was electricity, June 1752."